After 18 months of headaches caused by Vermont Health Connect, Gov. Peter Shumlin announced Friday that he's prepared to replace the online health insurance marketplace if it fails to meet two new deadlines. But the governor expressed confidence that his administration — and contractor Optum — will get the job done. 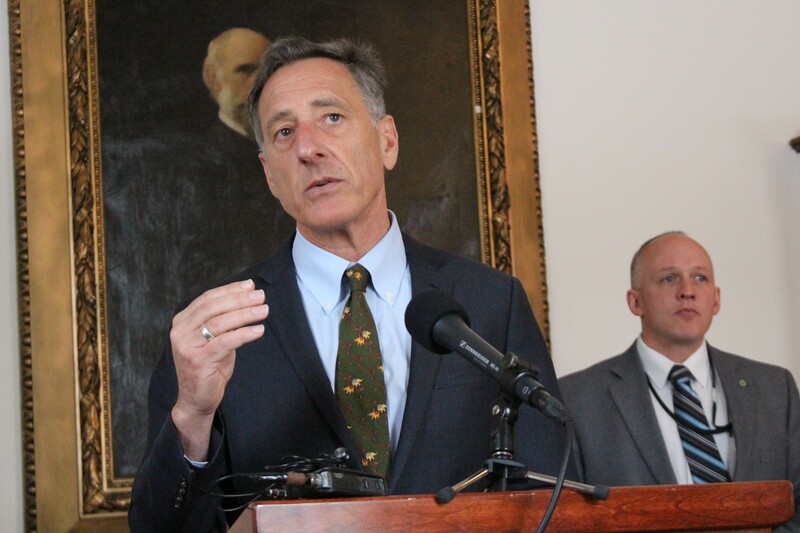 "We think that we're going to deliver finally on an exchange that's going to work for Vermont," Shumlin said at an impromptu press conference Friday morning at the Statehouse. "If not, we want Vermonters to know what the contingency plan would be." That plan would be to adopt what's known as a federally supported, state-based marketplace for those who buy private health insurance. Such hybrid systems — currently in use in Oregon, Nevada and New Mexico — make use of the federal exchange's web platforms and call centers, but allow states to retain control over which plans are offered. Shumlin said he would only deploy the contingency plan if Vermont Health Connect is unable to automatically process changes in account information by May or if it's unable to smoothly reenroll users by October. Even then, the state would not adopt the new system until October 2016, in time for the 2017 open-enrollment period. "Listen, there's enough skepticism about Vermont Health Connect and frustration so that Vermonters should know what our plans are should we fail," Shumlin said. "Now what I'm telling you as governor is: We expect it to work. We think it will work. But we also think it's fair that people understand what we would do if it didn't." Even as Shumlin outlined his latest contingency plan, his administration acknowledged that it would bring a whole host of new problems. "This is not an attractive option," Shumlin's chief of health care reform, Lawrence Miller, said at the press conference. For one thing, the outcome of a pending U.S. Supreme Court case could restrict users of such systems from enjoying $50 million worth of federal subsidies that make insurance more affordable. A hybrid system could also make it more difficult to deliver state subsidies to low-income Vermonters. Creating a new mechanism to buy private insurance may prove more expensive, Shumlin and Miller acknowledged, because the administration would still have to maintain the old system to serve Medicaid recipients. Reps. Adam Greshin, Jim Condon, Patti Komline and Heidi Scheuermann respond to Gov. Shumlin's announcement Friday at the Statehouse. The notion of adopting a federally supported, state-based marketplace was first publicly proposed in January by a tri-partisan group of House members: Reps. Jim Condon (D-Colchester), Adam Greshin (I-Warren), Patti Komline (R-Dorset) and Heidi Scheuermann (R-Stowe). Miller attended a Statehouse press conference they held to describe their idea and said he would take their recommendation seriously. But at Friday's press conference, Shumlin denied that the group's proposal inspired him. "No, we got this idea from ourselves, and the feeling that, you know, when I get complaints about Vermont Health Connect — and I'm out talking to Vermonters all the time — they say to me, 'What happens if it doesn't work? What happens if you can't fix change-of-circumstances?'" Shumlin said. "So, you know, let's put it this way: Republicans, Democrats, independents and Progressives are all getting the same frustration, and we thought it was the smart thing to do." 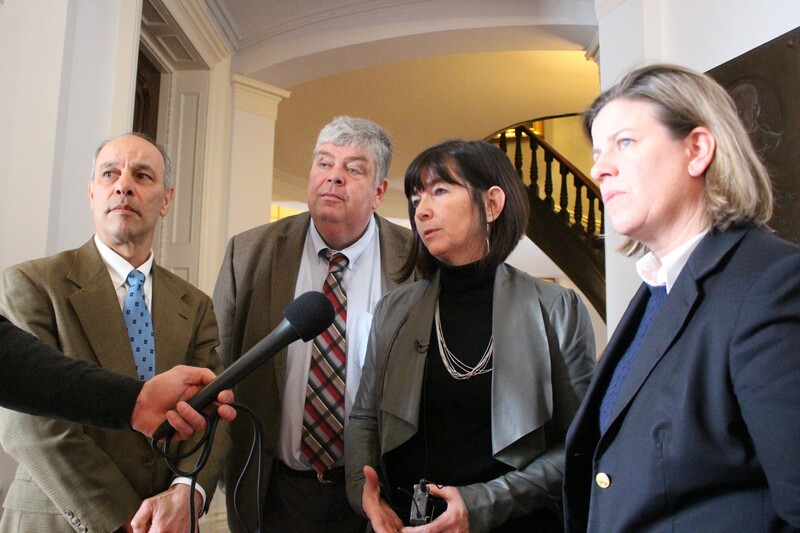 Speaking to reporters immediately after Shumlin's announcement, the four House members joked about Shumlin's response. "Maybe he had the radio on while he was dreaming or something," Condon hypothesized. "The old saying goes: You can get an awful lot done if you don't care who gets credit," Greshin added. All four said that while they were pleased the governor planned to investigate the feasibility of a hybrid system, they wished he would do so sooner. "I'm a little disappointed he's pushed it back to 2017," Komline said.